Until NAB this year when the 300u’s great granddaughter returned. And with a vengeance. 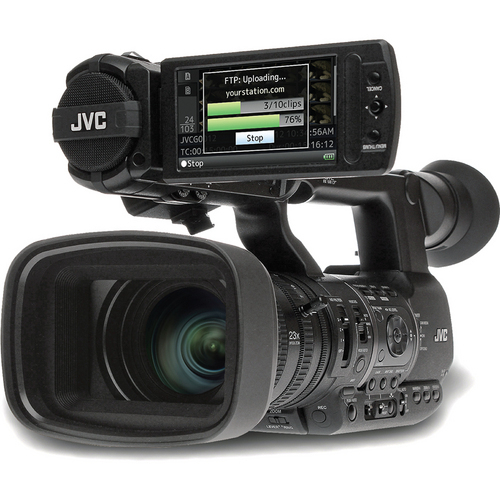 Meet the JVC ProHD Mobile News Camera! To me it’s an old friend gussied up and modernized. But it is a game changer and this time the time is ripe for it to reach the heights it missed last time around. What’s new? Okay, so I admit I’m addicted to glass. A 23x zoom. Something that can reach out and pull you (and your audience) in close to situations you don’t even WANT to get close to. Most prosumer cameras in this price range only have a 10x or 14x zoom, leaving you miles short of the shot you really want. Dual slot recording…the less expensive version of this camera, the JVC GY-HM600 ProHD Camera has two slots for continuous recording too, but lacks the ability to record in HD in one slot and SD in the other. That ability allows you to shoot HD for the main event but SD to stream back quickly to the station for on-air. Wow. I don’t even need to get into real manual controls, XLR inputs, three chips (1/3 CMOS)…the usual suspects in a pro’s array of necessary tools. What happened in the past ten years that makes this new again? 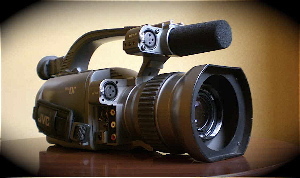 Well, this time news is READY for a camera like this. In 2002 (when I got my JVC 300u) going live on the web was something entertaining…fun. But nobody in real news considered it seriously. After all, it wasn’t really professional – was it? Tiny little camera, poor quality…and there were live trucks and microwave trucks to handle important stories. Times change…and now cell phones and Skype can put out decent enough (okay, so even I debate that one) images for news. Plus, reality has set in – financial reality. With the competition out there, lean and fast may make the difference between survival and death to cost conscious news organizations. And while I absolutely love those good ole days, I’m a realist. What I see is a camera that may mean survival. I’ve said it before… It’s just a matter of time until my broadcast camera is connected to my iPhone. Insanely Simple. And I’ve witnessed ENG guys in NYC FTPing their finished package from a smart phone. Bumped down version (definitely not HD) but it worked. Dean…with all the add-ons and gizmos to make camcorders go live, this is it. A camera that lets you stream right back to the station. Well, from what I can see it does that…haven’t seen anything that says LIVE streaming as in LIVE shots. But who knows…maybe it can or maybe that is the next step.